Monday's Child is happy, I am happy. I have both the original painting up for auction on Ebay simultaneously with prints of the same. If I can find six hours or so for the oil I should have this competed this evening. Long overdue; a much larger version to replace the Knoxblab / Raincrow painting which I auctioned off on Ebay a few months ago. Mailed off with guilt prints. Commenting will return after a persistent something understands that I am not interested in selling Viagra. A portrait of Julian Assange with leaky condoms for hair, in progress. A portrait of Julian Assange with leaky condoms for hair, in progress. By commission. 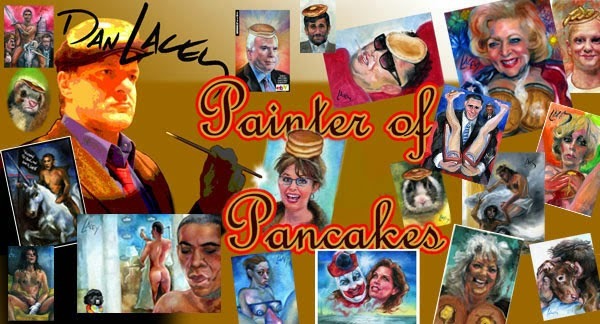 I'll be performing street pancake poetry at the Pancakes & Booze art show at The Loft in Minneapolis on May 20th. It will be warm by then.